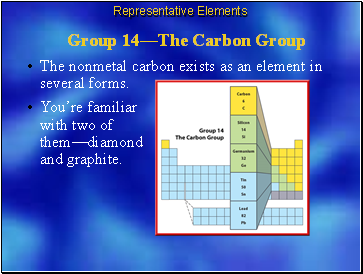 The nonmetal carbon exists as an element in several forms. You’re familiar with two of them—diamond and graphite. Carbon also is found in all living things. 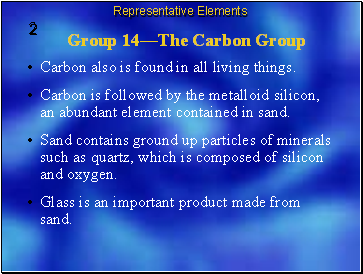 Carbon is followed by the metalloid silicon, an abundant element contained in sand. Sand contains ground up particles of minerals such as quartz, which is composed of silicon and oxygen. Glass is an important product made from sand. 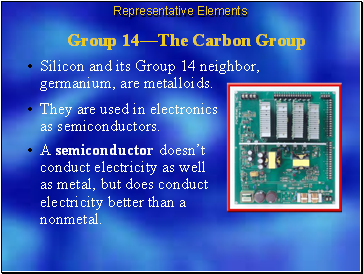 Silicon and its Group 14 neighbor, germanium, are metalloids. They are used in electronics as semiconductors. A semiconductor doesn’t conduct electricity as well as metal, but does conduct electricity better than a nonmetal. 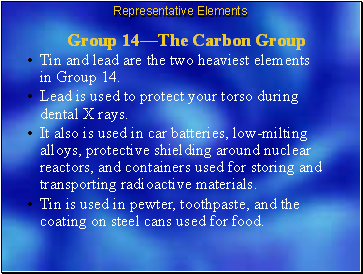 Tin and lead are the two heaviest elements in Group 14. Lead is used to protect your torso during dental X rays. It also is used in car batteries, low-milting alloys, protective shielding around nuclear reactors, and containers used for storing and transporting radioactive materials. Tin is used in pewter, toothpaste, and the coating on steel cans used for food.